It’s not all Ti and GeForce, you know? There are other graphics cards available such as AMD’s RX Vega. This is what manufacturer XFX desperately want to remind you of during these trying times for the red team’s Vega architecture. Their way of doing that? A sneak peek of their first custom RX Vega design. Want to crank your graphics quality up to 11? Here’s our top picks for the best graphics cards. If you are in the market for a third-party chiller for AMD’s RX Vega, then you’ve been ever-so patient with the red team since September. Only a single card – the ROG Strix from Asus – actually seems to have made it to the real-world, and even then only into reviewer’s hands – not yet reaching store shelves. XFX are an AMD-exclusive graphics card manufacturer and have little option when it comes to supporting the Vega architecture. Their latest design ditches the subtler and tamed designs of many other manufacturers, and goes a bit more old-school with the flair. 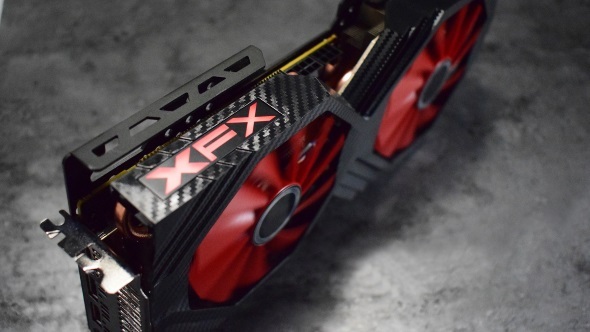 Coming with a fan design that sports a carbon-fibre-like black married up with a large splash of red, XFX are certainly not scared of making an impact with the design. It also features a cutaway shroud design around the standout red fans. In what may seem like a strange move, the power connectors are directly in the middle of the board, but with a look at the backplate, it’s apparent that the PCB doesn’t actually reach the end of the board’s length – with a hefty heatsink making up the remainder of the card. With such a minimal PCB design, RX Vega may have made for some fantastic single-fan compact graphics cards, with all that graphical grunt in a tiny package. Oh… what could’ve been. 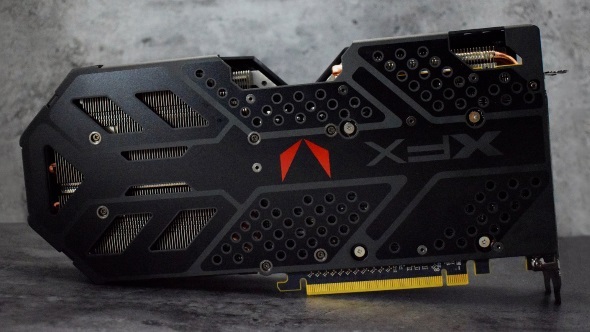 The XFX card seemingly ditches the eight-plus-eight pin power connectors, found on the reference design from AMD, in favour of six-plus-eight pin power delivery. The Asus ROG Strix struggled to tame the temperatures of the Vega tech in early reviews, but hopefully the XFX design with that chunky rear heatsink should fair a little better. Only time will tell… if the XFX Vega design ever makes it to market. The main issue with this teased card is that, yet again, it has no release date. We’ve been promised RX Vega third-party cards before, and yet here we are, still patiently waiting. With Nvidia’s GTX 1070 Ti launching en masse with custom card support from a foray of board partners, these teased designs only rub salt in the wounds of the few remaining potential customers sitting tight for partner RX Vega cards.